This watch is perfect, just the right size for a small wrist. The quality and price is amazing. I'd recommend this lovely watch to anyone. 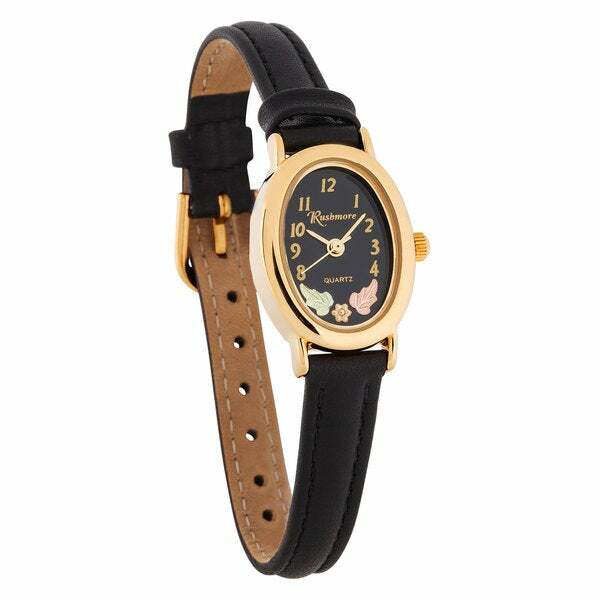 Be fashionably ontime with this features a black dial with a Rushmore illustration and decorative goldtone leaf detailing. Powered by a precise Japanese quartz movement for any occasion. I bought this watch because I enjoy wearing Black Hills Gold jewelry. I am very pleased with my purchase because it is exactly what I was looking for. It is dainty and elegant as well as functional. The face of the watch is easy to read and the band is high quality leather and easy to fasten. I recommend this watch to anyone who likes Black Hills Gold jewelry. I love this watch and wish I was going to be mine. I got this gift for my granddaughter and I know she will like it. It has beautiful color in the black hills gold,and the face of the watch the hands are clearly seen and it's easy to tell the time. The price of the watch was awesome. This watch is dainty and I know my 17 year old granddaughter will like it. Love black Hills Gold. Matches a ring and necklace that I have, I have small wrists and a larger watch looks like it belongs to a man. This dainty watch is gorgeous. albeit, I do not wear it around the house, but on occasions out. I have had many compliments on any Black Hills Gold I wear. Love it. I will give this watch to my granddaughter. It is really nice with the black background. The leather band is good for her to keep it on. I like the numbers showing also; it is just the right size for her arm. I recommend this watch to you for fashion and style. It is prettier than I thought it was going to be. I cannot wear a large faced watch, so this watch is perfect if you're petite or simply don't care for a large timepiece. The black hills gold at the bottom just stands out and is lovely. this was just what i wanted; the black face and black leather band; also, the black hills gold adds just enough feminine touch. quite comfortable. A must have for any black hills gold lover! Beautiful watch. Just the right size for my wrist. Black Hills company that made this watch is the best in SD. Love the watch. Thank you!!!! Got watch for 65th birthday!!! I love this watch, Best Buy ever, nice and slim can wear with bracelets no worry! I have never had a watch so pretty. This is pretty and elegant and it tells GOOD time, too. I love this watch. It is gorgeous and perfectly dainty. Very pretty watch and perfect for a smaller wrist. Gold dials and numbers on the black background make it easier for my mother to read time. She loved her gift! Very pretty, my aunt loved it as her Christmas gift. Small wrist and alleges to medals. Need a non medial wrist watch.